This entry was posted on July 29, 2013 by Paul. Our magnificent Penguin has again come out on top in an important study into computer mouse usage. Research carried out by two Masters students at the University of Brighton’s physiotherapy department found the Penguin fared best in a series of specially designed tests. 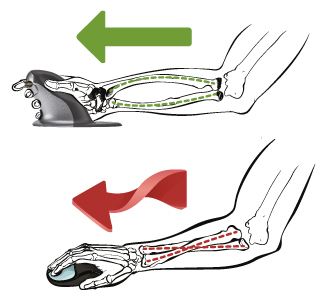 Measured against two other devices – the Evoluent and a standard mouse – the researchers found that the Penguin not only held the forearm in a lower risk, mid-range position but also demonstrated lower ranges of movement in all directions, making it particularly useful for people with overuse injuries of the wrist. The researchers also concluded that the Penguin would be the most useful device for people suffering from overuse of the extensor muscles of the wrist as it showed a trend for lower levels of extensor activity. In addition they found that use of the Penguin led to lower, more positive scores in the RULA (Rapid Upper Limb Assessment) tests carried out to assess posture. This meant the risk factors for the Penguin were lower than the other mice. These latest findings follow closely on the heels of an American usability study conducted by VSI Risk Management & Ergonomics of California which pitted the Penguin against three other mouse designs in tests to measure accuracy and precision; efficiency and productivity; optimal wrist and finger postures; comfort; and user preference for design and usability. Again the Penguin came out on top.